Alex Rodriguez has spent the past year entering Barry Bonds territory. The kind of tragic ending to a superhero story that nobody can rebound from. No matter what A-Rod does from this point forward, his legacy will be carved as a liar, a cheat, a steroid user, and a pompous jerk. Selena Roberts has spent the past year chronicling Rodriguez’s every waking moment. The Sports Illustrated journalist first broke the story of A-Rod’s past steroid use, forcing the All-Star third baseman to admit to the world that he had, in fact, used performance-enhancing drugs at one point in time. As if that weren’t enough, Roberts has been determined to bring the Yankee slugger down farther — despite the fact that everyone already hates him — by writing a book detailing all his transgressions over the past fifteen years. At this point, Rodriguez can do no more wrong. He’s already loathed by nearly every baseball fan in America, and even his hometown team’s fans will be hard-pressed to cheer for him when he returns from injury. You could break news of A-Rod’s involvement in a dog fighting ring, and few people would be surprised by now. You’ve seen ESPN’s Not Top 10. This is a lot like that, except it’s one better and has a different name. The Bottom 11 is the foil to our Top 11, a list of the 11 least awesome things to happen over the course of the past week in sports. Enjoy. 11. Alex Rodriguez lies while trying to clarify the truth. Remember those steroids A-Rod allegedly ingested? The ones that are illegal here, but as he claims, legal in the Dominican Republic? Apparently, the D.R. has no idea what he’s talking about, since the performance-enhancers he came clean about are, in fact, illegal in the mother land as well. When does the lying stop? 10. Texas Tech QB Graham Harrell runs a 5.07 40-yard dash time at NFL combine. No one ever accused the former Red Raider of being quick, but 5.07? That’s a bad high school time. Out of the way Graham, the senior citizen walkathon needs to pass you. With Alex Rodriguez adding himself to the list this week, we can now respectably field a team of All-Stars that have either a) admitted to steroid use b) been named in a report (like the Mitchell Report) linking them to steroid use or c) been cited by Jose Canseco (the great and knowledgeable steroid zen master) as a steroid user. Unlike our usual Top 11, we’ll countdown by position, rather than number, in putting this list together. Eight (8) position players, one (1) starting pitcher, one (1) relief pitcher, and one (1) designated hitter. On to the list. So you’ve been convicted of steroid use. Now what? You’re going to need a plan. That’s where we come in. Here at Seattle Sportsnet, we’ve come up with a baseball player’s guide to dealing with the allegations of steroid use. You may want to read this over, because you just never know when a report with your name on it will be coming out. Step 1: Go into hiding for two or three days while you weigh your options. You’re suddenly the most sought-after figure on the planet. There’s no need to make yourself readily available to the general public right away. Why not milk this thing for all it’s worth, right? And in the meantime, carefully consider the things you’ll say once you finally reveal yourself. Remember “Choose Your Own Adventure” books? This is a choose your own adventure situation. You can either accept or refute the allegations against you, but no matter which road you take, make sure that you are 100% committed to the lie or truth that you will unveil. 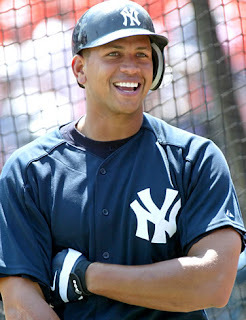 Alex Rodriguez admitted to using steroids and I don’t care. Whether he used steroids or not, Alex Rodriguez is still one of the least likable baseball players of our generation and, even with his admission, I couldn’t care about him any less than I already do. The former Mariner was accused of using banned substances during 2003 in a Sports Illustrated article that was released over the weekend. Earlier this morning, Rodriguez sat down with ESPN’s Peter Gammons and acknowledged that the allegations were true, going so far as to admit steroid use during 2001 and 2002, as well.